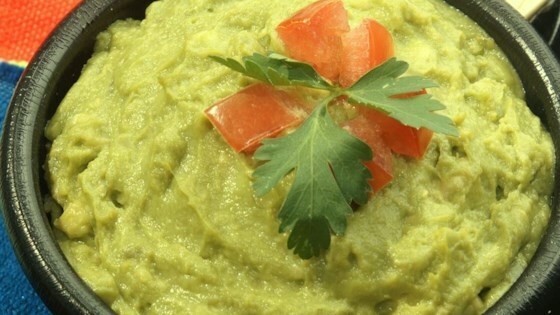 "The real trick to great guacamole is to use good avocados. Make sure your avocados are ripe and of the Haas variety! Serve this dip with corn chips, or an array of fresh vegetables." You can't have guacamole without cilantro. I would leave out the oil, add some fresh chopped cilantro and chopped tomato. This is a good base recipe, but for really good guac, you have to add some fresh cilantro, garlic powder & tomatoe. I would also omit the olive oil, Makes it oily & slimy. I thought this recipe was great, I just added a little garlic and tomato and it was the best guacamole I ever tried.